“Romance” may not be the first word that springs to mind when you’re making pancakes. But consider again. 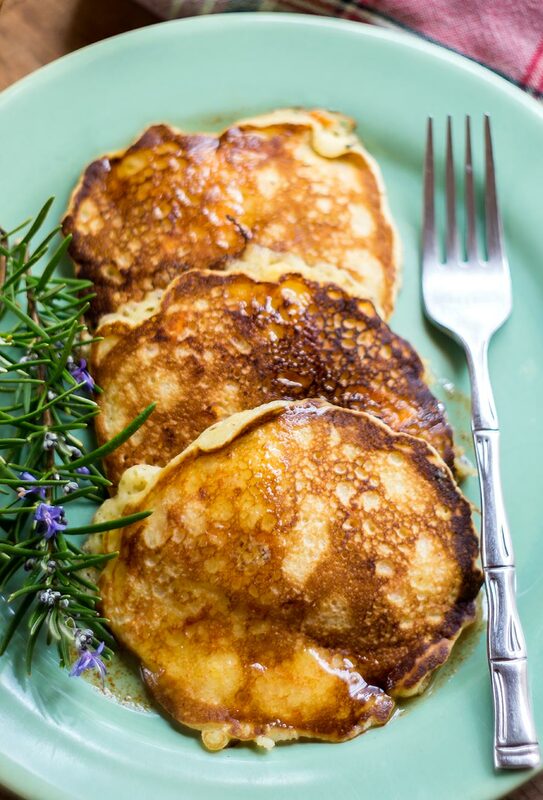 Our Sweet Potato & Cornmeal Pancakes with Spicy Maple Syrup are sweet, they’re hot, they NEVER disappoint – and they’re a delight to wake up to in the morning. Sounds a lot like true love. We’re not talking about your usual pancakes. These tender cakes are light and fluffy, of course, but they’re also generously laced with tasty bits of shredded sweet potato and just the right amount of cornmeal for sincerely satisfying texture and flavor. 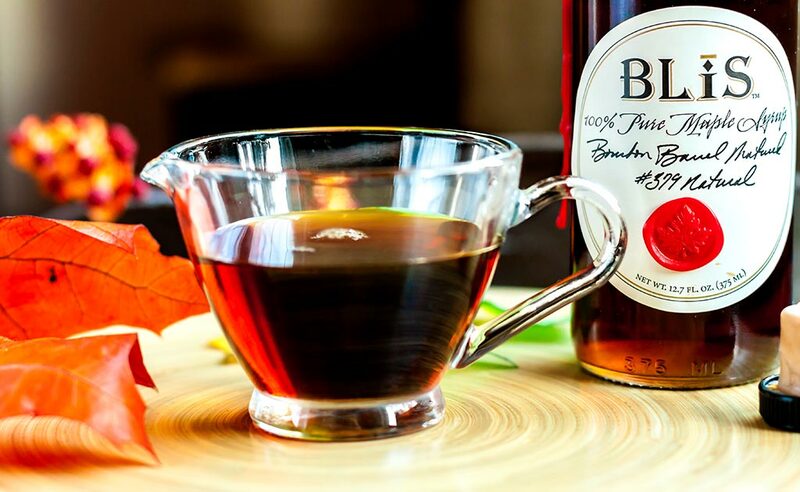 Now for some real heat: get your hands on some top quality maple syrup, like BLiS Pure Michigan Bourbon Barrel Aged Maple Syrup (our favorite). Here’s where it gets interesting – stir in some HOT ground cayenne pepper, about a half teaspoon per cup of syrup. While you might be skeptical at first, trust us – the combination of pure, sweet syrup and spicy-hot pepper is to die for. Like they say, opposites attract. Our advice? 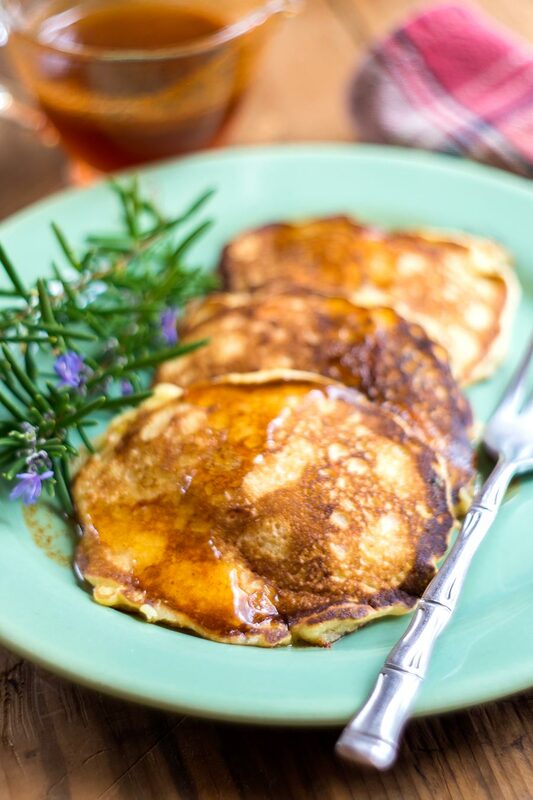 If you’re hoping for some real romance this Valentine’s Day, get busy and whip up a batch of hot, steamy golden-brown Sweet Potato & Cornmeal Pancakes (and don’t skimp on the syrup). Put the coarsely grated sweet potato into a microwave-proof dish and cover tightly with cling film. Poke a couple of small holes in the film to allow any steam to escape. Microwave for 1 minute, just long enough to slightly cook and soften the sweet potato. Set aside to cool. Mix the dry ingredients together in a bowl. In a large bowl, whisk together milk, melted butter or oil, eggs and vanilla until frothy. Stir in the dry ingredient mixture until just moistened (the batter should be lumpy). Gently fold in the shredded sweet potato and set aside to rest. Heat a large non-stick pan over medium heat. Moisten a folded paper towel with oil and rub the pan to lightly coat it. Carefully ladle about 3 – 4 tablespoons of the batter into the pan for each pancake. (Don’t crowd the pan.) Cook the pancakes until the tops are covered with bubbles, about 3 to 4 minutes. Flip and cook the other side until the bottoms are golden brown, about 2 minutes. Remove to a plate in a warm oven and continue cooking the pancakes in batches. Serve immediately with Spicy Maple Syrup. Combine the syrup and cayenne pepper powder in a bowl and stir well to blend. Pour into a small syrup pitcher to serve. TIP – substitute chipotle chile pepper powder for cayenne for a bold, smoky flavor.